The Catholic Church recognizes fourteen Canadian saints. These include the Canadian Martyrs (North American Martyrs) as well as four women, a bishop and a religious brother. Here is a brief description of who each of these Canadian Catholic saints were. I’ve also got a FREE printable Canadian Catholic Saints Kids Activities Pack to help you teach your children about these holy men and women of Canada! The Canadian martyrs were Jesuit missionaries who worked with the Hurons in New France in the early 1600s. They were killed during wars between the Iroquois and the Huron. All were canonized in 1930 and their feast is celebrated in Canada on September 26. 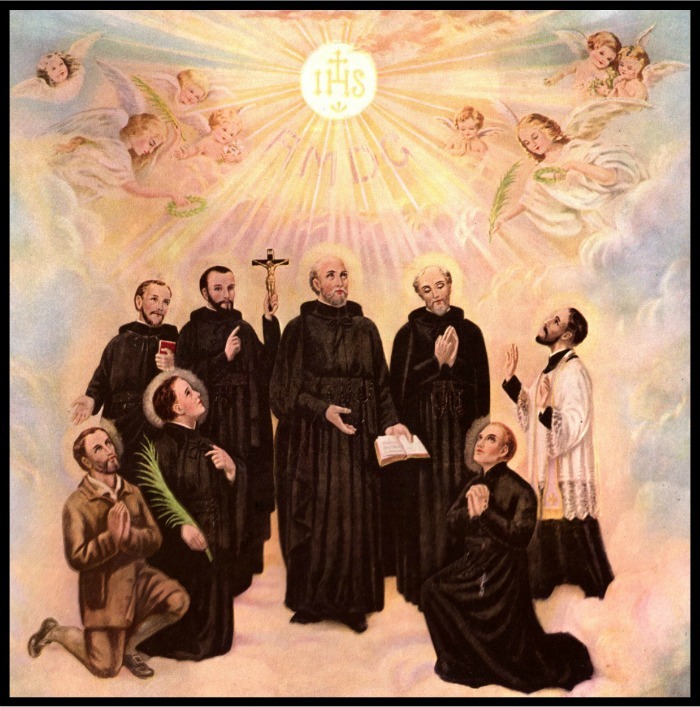 They’re also known as the North American Martyrs, and their feast day is celebrated in the U.S. on October 18th. Saint René Goupil was a Jesuit Novice who was born in 1608 and martyred in 1642. He suffered bad health, but studied medicine and worked with the Jesuits in Canada. He was the first martyr, killed in New York with Isaac Jogues. Saint Isaac Jogues was a priest who was born in 1608 in France and martyred in 1646. He came to Quebec in 1636 and was captured by the Iroquois in 1642. He was rescued and went back to France, but returned to Quebec where he was again imprisoned and this time killed. Saint Jean de La Lande was martyred in 1646. He served with the Jesuits as a layperson in New France. In 1646, he accompanied Jogues on a mission to the Mohawk and was captured with him. After Jogues’ death, he attempted to recover the priest’s body and was killed. Saint Jean de Brébeuf was a priest who was born in 1593 and martyred in 1649. He lived with the Hurons for more than 15 years and, with his assistant Gabriel Lalemant, refused to leave his people when they were attacked by Iroquois. Saint Gabriel Lalemant was born in 1610 in Paris and martyred in 1649. He became a priest in 1630 and spent two years in Quebec before joining Brebeuf in the Huron missions. Saint Charles Garnier was a priest who was born in 1606 in Paris and martyred in 1649. He joined the Jesuits in 1624 and taught at a Jesuit college before being ordained in 1635. The following year, he arrived in Quebec to minister to the Huron. Even when the mission was attacked and he was wounded, he continued to baptize neophytes and to assist a wounded Huron. Saint Antoine Daniel was a priest who was born in 1600 in Dieppe, France, and martyred in 1648. He became a Jesuit in 1621 and arrived in Acadia (present-day Maritimes) in1632, then went to Quebec. He founded the first boy’s college in North America in Quebec in 1635. He spent twelve years with the Huron before being murdered by the Iroquois. Saint Noel Chabanel was a priest who was born in 1613 in France and martyred in 1649. He was the youngest of the Canadian martyrs. Saint Marguerite Bourgeoys was born in 1620 in France and died in 1700. She started the first school in present-day Montreal and founded an order of religious women, the Congregation of Notre-Dame. She was able to convince the bishop that her Congregation should remain an active teaching order—a unique idea then—rather than being joined to a cloistered order of Ursulines. She was canonized in 1982 (the first female Canadian Catholic saint) and her feast is January 12. Saint Marguerite d’Youville was born in 1701 at Varennes, Quebec, and died in 1771. She was married for eight years before becoming a widow in 1730 and had three children. She founded an order of religious women, the Sisters of Charity, commonly known as the Grey Nuns. With the Grey Nuns, she established hospitals in Montreal and across Canada. She was canonized in 1990 and her feast is October 16. Saint Kateri Tekakwitha is also known as the Lily of the Mohawks and is the first Native American to be canonized a saint. She was born in 1656 in New York State, but her parents both died in a smallpox epidemic when she was four. She was raised by her aunt and uncle but always remembered her mother’s faith and joined the Catholic Church as a teenager. She was persecuted by her tribe and eventually left her village to join a Catholic community in Canada. She died there at age 24 and was canonized in 2012. Her feast day is July 14. Saint Marie de l’Incarnation was born in France in 1599. She married when she was 17, but her husband died two years later, leaving her with an infant son. Marie retreated to a secluded life and joined the Ursulines in 1633. Six years later, she joined several other nuns in a journey to Quebec, where she was both businesswoman, mystic, and teacher. She died in 1672 and her feast day is April 30. Saint André (Alfred Bessette) was born in 1845 in St-Gregoire-d’Iberville, Quebec, and died in 1937. He was orphaned when he was twelve years old and worked for a while in textile mills in the United States. He joined the Congregation of Holy Cross in 1870 and founded St. Joseph’s Oratory in Montreal. He was canonized in 2010 and his feast is January 6. St. Francois de Laval was the first bishop of New France. He was born in 1623 in France and entered the local Jesuit college at the age of eight. He spent the next decade studying theology and became a priest in 1647. He was appointed bishop of New France when he was 36 and “is admired for his pastoral work among the Aboriginal Peoples and the settlers of New France, and for trying to defend Native People from being exploited by merchants and governors through the sale of alcohol” (CCCB). He was canonized in 2014 and his feast day is May 6. 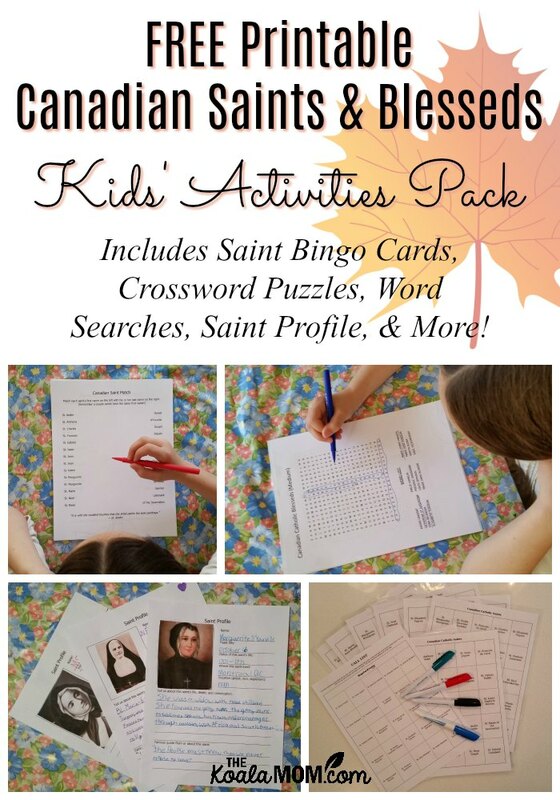 Subscribe to my weekly email newsletter to download your FREE printable Canadian Catholic Saints & Blesseds Kids Activities Pack, which includes 8 Bingo cards with 30 Canadian saints’ and blesseds’ names, crossword puzzles and word searches, saint matching and sorting games, and a saint profile sheet. These activities are intended for kids about Grades 2+ (or children who can read and write). This Kids Activities Pack would be great for catechism classes, homeschool lessons, or a Canadian All Saints Day party. This website will give you a list (up to 2015) of Canadian saints, blesseds, venerables, and servants of god. This was interesting! I had never heard of most of these!